About 10 years ago, I went through a phase of wanting our Christmas tree to be perfectly coordinated and grown-up. All the cartoon ornaments from our childhood just weren’t working for me as I dreamed of having the Pinterest-perfect tree, long before Pinterest even existed. The phase lasted a year or two before I missed the joy of unwrapping all the random ornaments each year. That process always spurs happy memories, so I clearly was having some sort of mental-lapse to skip it. I realized that it doesn’t have to be an OR decision. I could have a tree that looks gorgeous from a distance, and then becomes even more special up close. 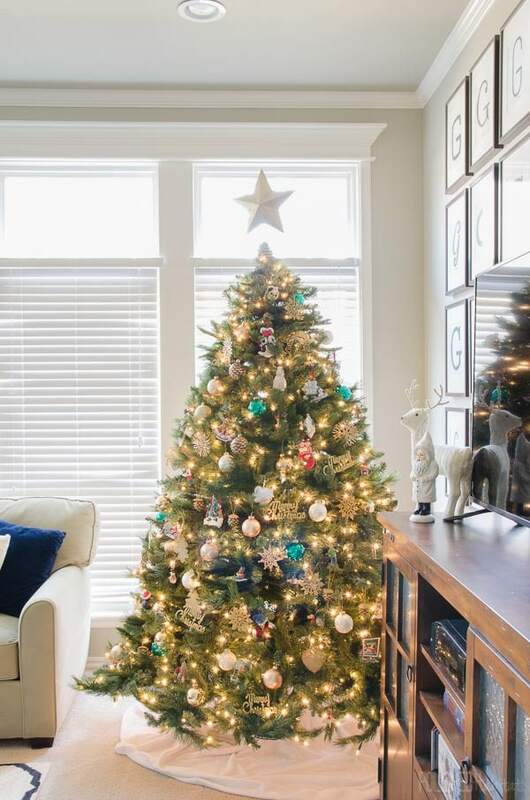 When I heard the theme for the My Home Style series this month was Christmas Trees, I knew I could share how we keep our main tree pretty AND personal! Of course, I’m still obsessed with everyone’s gorgeous trees, and can’t wait to start at Casa Watkins Living (our fabulous host) to work my way through all the blogger’s unique trees. You may remember the last My Home Style before & after edition post, where I defined my style as Modern Industrial Glam. 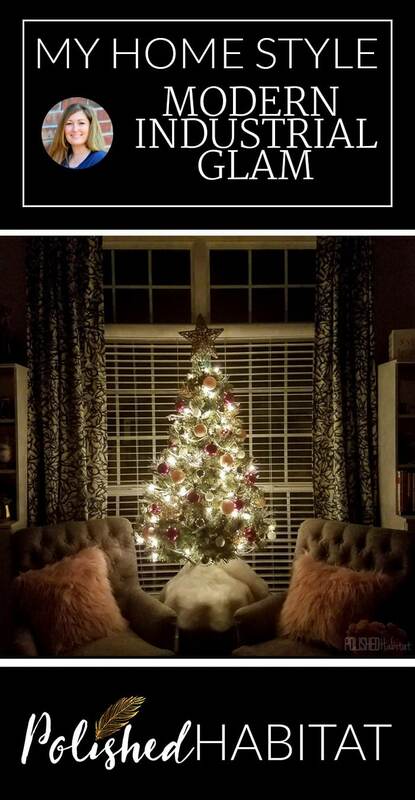 Our Christmas tree contains some nods to the style, but this is a great example of knowing when to stretch your decor outside your “normal” style. My first priority was having a tree full of memories in the living room. I’d love to add a second big tree decorated exactly to the Modern Industrial Glam style next year, but I always envision the living room tree being more of a mish-mash of happiness. Here’s what it looks like from a distance. Then up close, there are so many fun things to find. 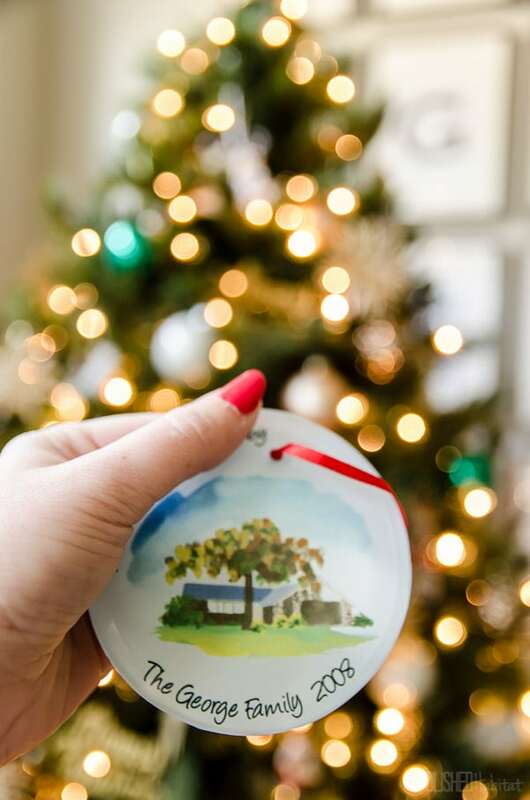 Our favorites are the personalized ornaments we received every year from Gram. I snapped a picture of the full set before we put them on the tree. We also have other gems like this ornament my mom-in-law ordered of our old house. I can’t find the exact maker, but Etsy has lots of fun options (affiliate link) if you’d like one for yourself or as a gift. To complement all the special gifted ornaments, I added some of my style while also adding consistency. I start the tree decorating with white and gold bulbs spread out around the tree. They add lots of shimmer and glam! I picked up a set of unique snowflake ornaments at a German Christmas Market I go to each year with my mom. They are the perfect blend of traditional and modern. By spacing out all the repeating ornaments first, the tree feels less chaotic than it would with 100% individual ornaments. For us, it’s the perfect Christmas tree! Since I pretty much broke all the rules and showed you that our main tree wasn’t an exact fit into My Home Style, I thought I should show you the small Modern Glam tree in my office too. I’ve never been able to have a tree in the front window before, so I’m pretty excited about that! It’s pretty awesome during the day, but at night it really shines! Now that you’ve seen my trees, make sure you pop over to the next stop on the tour, Southern State of Mind. 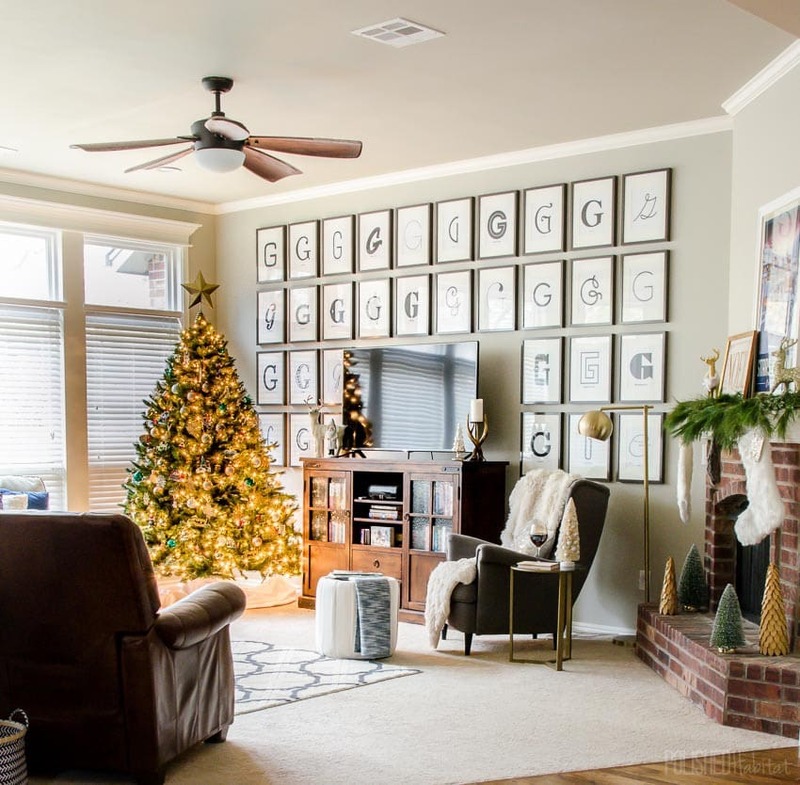 When you get to Stephanie from Casa Watkins Living, make sure you thank her for coordinating all these inspiring tree posts. I’ll be making lots of notes with fun tree ideas for next year! i love a tree full of memories! our living room tree is our main tree and it’s full of special ornaments. in the years past we’ve had those but then i have added vintage ornaments in color themes… this year i said forget it! i added a few blue ornaments but otherwise, it’s all family stuff. and we all had fun decorating together and that’s what it’s all about. but like you i have a secondary tree that gets to be my pretty. and i dont’ mean my pretty tree, i mean my pretty, like my precious. 😉 love your trees, melissa! Aw! Love your trees, Melissa! I always look forward to pulling out a few special family ornaments as well! 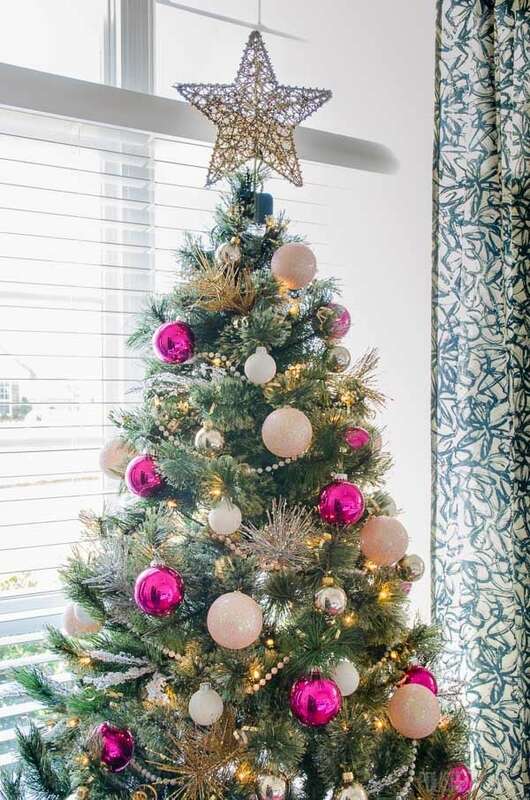 And I just love the pinks on your little tree in the office! So beautiful Melissa!! Love the colors and those ornaments are really popping!! Wowzer! Your tree is a show stopper. Great tips for making it stylish and personal. 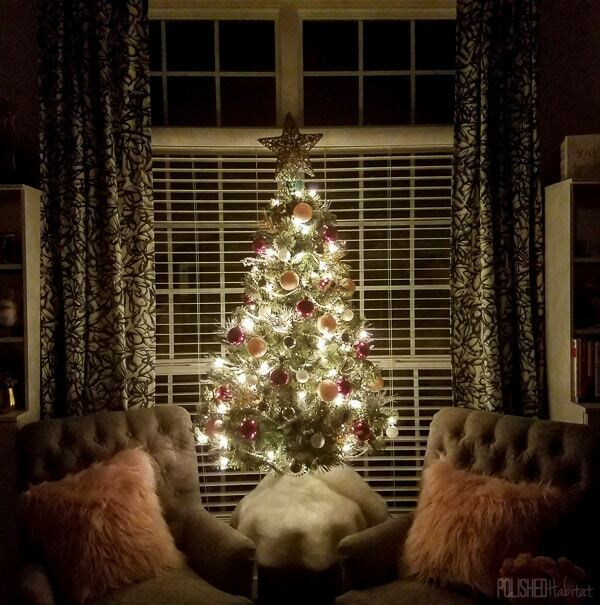 Love that glamorous tree in your office too! You do! Adding a tree is always a good idea. I like the idea of the individualistic ornaments too 🙂 Great job with both trees! Thank you, Angie! The G wall was a wacky idea, but turned out really well! I love your tree so much because of all the meaning behind the ornaments. I wish I had more special ornaments like that- this inspires me to start a new tradition with my niece and nephew. Yes! You should do that! My mom usually gets each of us an ornament as well. At one point, my husband and I picked one out for each other as well and we need to go back to that. Your trees are beautiful. 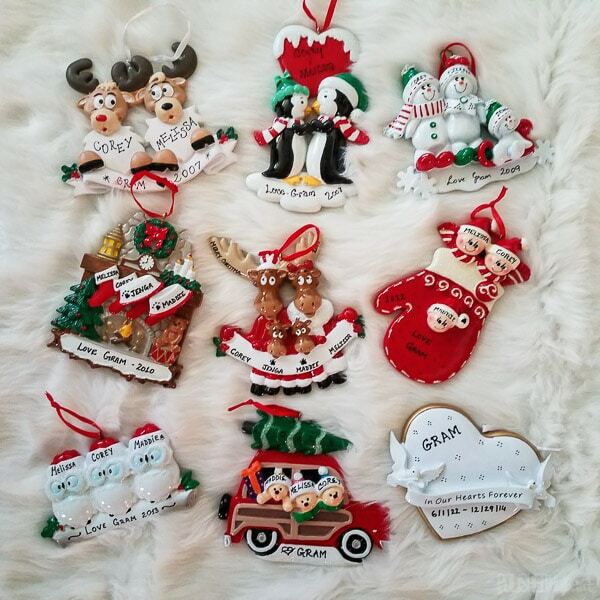 What fun having ornaments that have wonderful memories and are from special people. Thanks for sharing. Family ornaments all the way!! Your tree is so beautifully lit and decorated. Thank you for sharing it. Your home is always so beautiful! 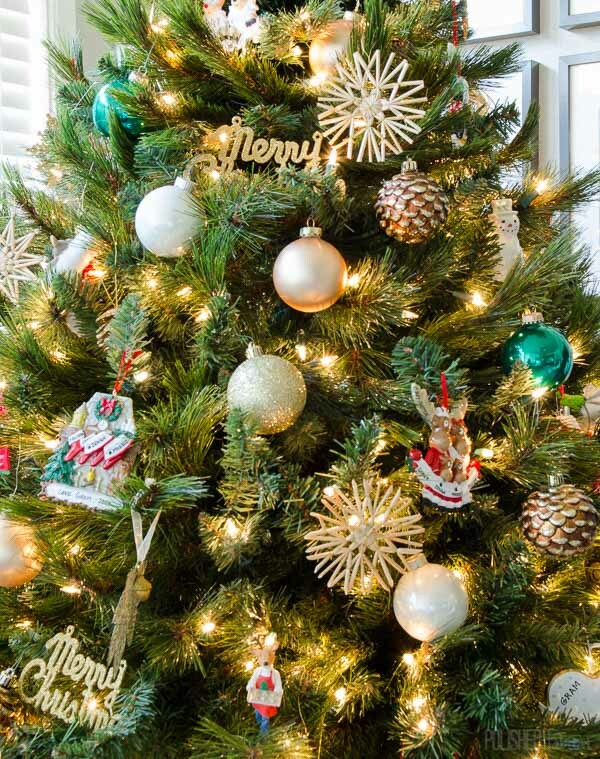 I love the mix of tradition and glam on your tree! I think it is perfectly pinerest worthy in every way! Pinning!